Two weeks on from the curtain-raiser at Silverstone, the FIA Formula 3 European Championship heads for another renowned Formula 1 venue this weekend, as Felix and the rest of the F3 fraternity take to German Grand Prix host Hockenheim for round two of the 2014 campaign. 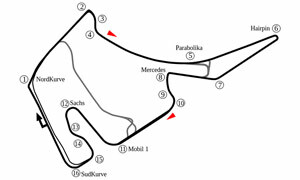 One of Hockenheim’s most exotic features is its “Parabolika” semi-straight. This pedal-to-the-metal left-hand sweep halfway around the lap creates a real technical dilemma for engineers, with the rest of the track being made up of a mixture of slow, medium and high speed corners. The fine balance between potentially race-winning top speed at the end of the straight and sufficient grip in the other sections of the circuit forces teams into a car set-up compromise, which often puts the driver in a difficult situation as he either struggles for straight-line speed or performance in the sweeping Motodrom at the end of the lap. Turn 1 is one of the fastest and most spectacular on the entire calendar, taken at well over 200 km/h. The exit consists of a wide tarmac run-off area that is sometimes used a bit too extensively by drivers, leading to penalties or even to the occasional high-speed crash. Each round of the FIA Formula 3 European Championship is made up of three races, all of which are of equal length (35 minutes) and importance for the outcome in the title chase. The points structure mirrors that in use in Formula 1, running to the 25-18-15-12-10-8-6-4-2-1 system. The grid for all three races is set in the two qualifying sessions. For Race 1, the starting order is established by the outright results of Qualifying 1, while the subsequent second qualifying session forms the grid for Race 2. For Race 3, the grid will be based on each driver’s second-fastest lap in Qualifying 2. The full 2014 calendar can be viewed here. As always, www.felixracing.se will be fully updated throughout the weekend, with reports from each of the sessions that take place. The website is the central hub of information for everything that goes on both on and off the track, and will also feature other relevant news, pictures and videos. All three races at the event will be streamed LIVE at www.fiaf3europe.com. In addition to the real-time broadcasts, a new-for-2014 agreement will also see Eurosport produce a magazine-style wrap-up show to be aired on the Tuesday following each round. The interaction with fans and followers will principally involve Felix Racing’s official Facebook Fan Page, where supporters can discuss all the goings-on and post potential questions to Felix. Tweets will also be forthcoming through Felix’s own Twitter account (@FRosenqvist).